Originally known as The Spats, they were formed in Toronto in 1964 when drummer Skip Prokop left Riverside Three and got together with former Last Words guitarist/vocalist Bill Misener (Bill Marion), a fellow Hamiltonian. Scarborough natives Chuck Beal on guitars and bassist Denny Gerrard rounded out the original group. Within a short time they'd become one of the area's hottest local acts, combining an infectious jazz beat with a British-invasion look & sound. After a name-change in '65, the group attracted the attention of local manager Duff Roman. They were signed to his Red Leaf Records label and that March issued "Never Send You Flowers" as the group's debut single. Written by Marion & Prokop, it soon became a modest local hit, as did the follow up "If I Told My Baby". By the end of the year Roman signed them to his new label, Roman Records, releasing "For What I Am" as their next single that summer. A cover of "Long Tall Sally" followed in the spring of 1966, by which point the group had parted with Roman and signed with Bernie Finkelstein. While Roman would later go on to a successful career as program director for one of the area's biggest radio stations, Finkelstein's later accomplishments included handling Bruce Cockburn career a few years later. Finkelstein arranged a one-record deal for The Paupers with the Canadian arm of Columbia Records, which resulted in the single "Heart Walking Blues". However, Marion left shortly after, subsequently recording a solo single before moving into production work. They replaced him with Scottish immigrant Adam Mitchell. Only weeks later Finkelstein got the band signed to MGM in New York. One of their early highlights was appearing at a 14 hour pop festival held at Toronto's Maple Laff Gardens. In early 1967, Finkelstein sold the band's interests to Albert Grossman, who was also handling Bob Dylan and Peter Paul & Mary at the time and would later manage The Band. Grossman renegotiated the MGM contract and signed the band to its associate Verve Forecast. "If I Call You By Some Name", the first single featuring Mitchell was released shortly after, reaching #31 on Canadian charts and became the band's biggest hit. They travelled to NY to open for Jefferson Airplane that March before working on their album debut with producer Rick Shorter. Upon completion of the sessions they found themselves on the West Coast where they became regulars at San Francisco's Fillmore Auditorium, LA's Whiskey A Go Go and then the Monterey International Pop Festival that June. By the time they'd returned to Toronto later that summer "Magic People" became their latest single - followed shortly after by their first full-length album of the same name. By late '67 MAGIC PEOPLE had peaked at #178 on the US charts, hardly ground-breaking, even for a debut album. "Think I Care" was released as what would turn out to be the band's last single. They were on the road for nearly a year straight when Gerrard left the group, to be replaced by Brad Campbell (who worked with Marion in The Last Words). 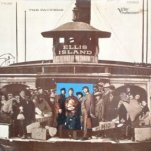 They released their second and last album ELLIS ISLAND in the fall of '68. Produced by Elliot Mazer, it was very much the follow-up to a band's debut, nothing overly radical or daring. Though they'd modified their look from a quasi-Beatles to more of a psychadelic beatnik image, the album was basically alot of British influences in simple melodies and hooks. Mitchell & Prokop had either singlehandledly or as a joint effort written all 9 tracks, with the exception of "Yes I Know", which Campbell co-wrote with them. By mid '68 Prokop was unhappy with the direction the band was going and left to do studio-work with the likes of Big Brother & The Holding Company, Al Kooper, Peter Paul & Mary and Ian & Sylvia Tyson. Despite the relatively strong writing in tracks like "Cairo Hotel", the quirky "Another Man's Hair on My Razor" and "Julliana", no singles were released. The band carried on briefly with new drummer John Houston, but the writing was on the wall. Gerrard returned and they set off to do a series of shows to pay off existing debts. But they were now without a record deal and failed to land any decent gigs that might improve the situation - and they called it quits by the end of the year. By mid '69 Prokop had resurfaced after forming Lighthouse with Paul Hoffert. Gerrard would later record the solo single "Sinister Morning" in 1969 before drifting out of the limelight and becoming a studio musician. Misener became a producer, Campbell went on to play with the likes of Janis Joplin and Mitchell carried on a moderately successful folk career, releasing a number of singles in the 70's & 80's. Denny Gerrard resurfaced in the mid 70's in the Lisa Hartt Band, which also featured Ray Blake, formerly of Mashmakhan.